WANT TO SEE SPECIAL? HERE YA GO! 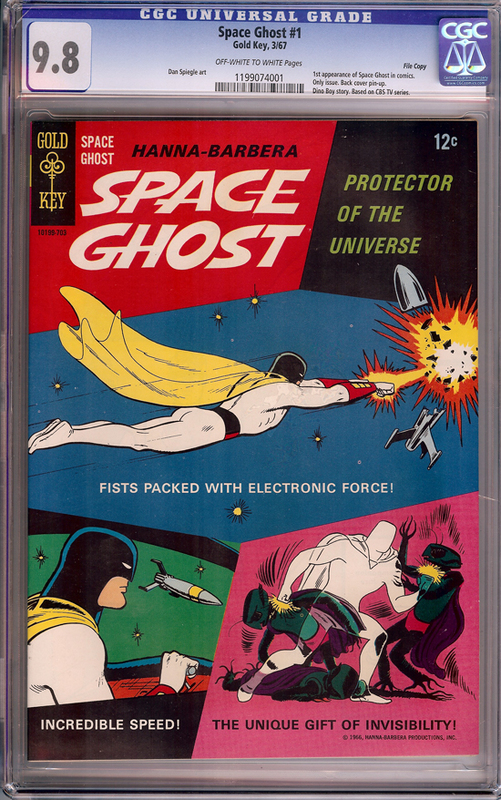 THIS IS THE SINGLE HIGHEST GRADED COPY OF PROBABLY THE MOST SOUGHT AFTER GOLD KEY COMIC, SPACE GHOST #1. THIS WAS THE ONLY ISSUE OF THE TITLE, AND IT'S A GOLD KEY FILE COPY TO BOOT. BASED ON THE TV SERIES IN 1966, THIS ISSUE ALSO HAS A DINO BOY STORY AS WELL. YOU WILL NEVER SEE ANOTHER ONE OF THESE COME UP AGAIN IN TRUE NM/M CONDITION. FAST APPROACHING ITS 50TH BIRTHDAY TOO. INVESTMENT QUALITY.